The one thing I think that sets this blog apart from every other blog I’ve come across (due to the vastness of the blogosphere—hideous word BTW—I’m probably not alone, I just think I am) is that I try to open up my writing process for outsiders to observe. There’s my weekly stat and sanity checks (which are less to do with process than progress), my thoughts on books and music (two key natural resources for the production of my Fiction McNuggets) and, occasionally, I open up my notebooks or my W.I.P. folder and reveal the Wizard is just a man pulling knobs and twirling cranks behind a curtain. Today I am going to walk you through the unique process I underwent for my latest short story, ‘Untitled (Crimson and Gold)’. It’s only wee (1,400 words) which should help this discussion no end. It also means I only went through two drafts, one on the seventh of February and one today on the first of March. it occurred to me today that if i could write, i'd write a short story about a girl who has never picked up a hitchhiker due to the horror stories about crazy psychokillers, but on a whim when she's having a good day decides to pick one up, and then kills him in a car accident. What immediately got me thinking was not the hitch-hiker idea but the “if I could write, I’d write X.” A lot of people think they have a book in them, and keep their good ideas mum in the hopes that they will one day sit down and write. A much smaller percentage actually make it to the end of their book. A smaller percentage still will actually get that book into print. Rather than try to discourage this anti-social, anti-commercial impulse, I think everyone should try and write their story. But I also believe, with all the potholes a beginner writer must face, it’s a good idea to get people to think about certain things before they put fingers to keypad. So my reply to Laura laid bare the thoughts which ran through my head as I considered how to write the story of her hitch-hiker idea. The story would probably do something else for the first few pages, probably Laura having hilarious relationship problems or feuding with her parents, which would precipitate her getting on the road and having that whim to pick up a hitchhiker. The story would be between 2500 and 4000 words. The crash would occupy only the last 500 or so words. Alternately, the story could start with the hitchhiker in the car and be dialogue heavy. The hitchhiker would do most of the talking, initially, which makes Laura uneasy, but then sets her at ease. She confides in her passenger that it is her first time picking up a hitchhiker. She explains what precipitated her decision. There would be a hint of a love connection, of a serendipitous bringing-together, and then the car would smash into something. Or, the story could mostly be about the aftermath of the accident. Some people would like this story for its psychological realism. But the irony of killing the hitchhiker would mostly be lost, like starting a joke with the punchline. The hardest part with the story would be the ending. Knowing when to stop, and getting the right mix between irony/twist/punchline pay-off, and the sense that this is just a slice of Laura's life which will continue on and she was not just created for the duration of the story. …I found your comment about 1st vs 3rd person really interesting. I guess it never quite occurred to me that when you write a character they are such a real person to you that their thoughts… could shine through without you necessarily intending them to. Anyway, that's all really interesting - and if you do seriously want to do anything further with it, then absolutely, it's all yours. She actually gave me permission to write the story twice in her email… so of course, the days later when I stalled at 1,700 words for the day, I opened a new Word document and started typing. Sometimes you have to write 948 to find out you can’t pull something off. And so the file entitled “Laura killing hitchhiker 7 Feb 08” sat in my short stories folder untouched until today. Had I thought about this story over the intervening three weeks? A bit. I must have been thinking of it yesterday, because I realised I could combine it with another idea, which again did not come from my own experience. At some stage during the week 11-17 Feb, Marisa came home and told me the story about a woman breaking bottles of wine in the supermarket and just walking away (I noted down this idea on the notebook page which appears here). Yesterday I thought: maybe the character of Laura I built up in the hitch-hiker story (whom I liked as a character) could be transplanted into in this wine smashing story as the observing narrator. Part of me believes you should always start a rewrite from scratch. Especially if you’re doing an overhaul of the magnitude of this one (same character, different story). But I never listen to this part of me. This leads to a lot of contrivance and wasted energy, but sometimes it leads me to a third alternative. Looking at this hitch-hiker story and this (unwritten) wine smashing story, I realised neither were strong enough to stand alone and yet they seemed to be speaking to each other. There would be smashes in both stories. In one, Laura acts when she wouldn’t normally and has an accident. In the other, Laura observes another’s accident, but this person doesn’t seem affected by her misstep. It was this gap, this yawning guilt-gap, between the two stories that told me I could write these stories as one. I started with Laura in first person (the hitch-hiker story was in third person) talking about guilt and leading in to the supermarket scene. Then I looked back at the third person story and thought a lot of the humour would be sucked out in first person, and went through it imagining it was Laura writing in third person as a kind of therapy. It’s okay to attribute your memories to other people. To talk of your past in the third person. It’s healthier than not talking about it all. This is what Dr. X says. I’ve already used the ‘first person quoting a therapist/grief counsellor in the first paragraph’ technique (in ‘Copies’, forthcoming in The Best New Zealand Fiction Volume 5), but that was actually a positive because in the short story collection I’m bringing together, the idea of copies (!) and imperfect repetition plays out within and across the stories. So two therapists? Bring it on. 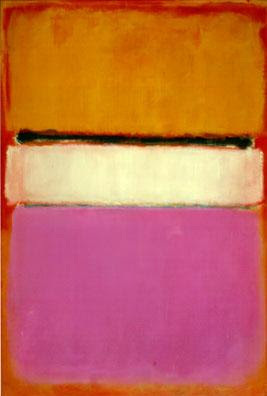 White Center, Mark Rothko, 1950. (Entschuldigung if I’m annoying anyone by posting this reproduction without permission… it stays till I get told off). Okay, so it’s more pink and orange rather than crimson and gold (I’m aware of the Tommy James/Joan Jett/Jimmy Eat World echo), but if and when you read the story it should rings some bells. Speaking of “if and when”, most publications get shirty if stories have appeared anywhere online before, blogs included, so I’ll try eek a publication credit out of Laura and Marisa’s ideas (and my elbow grease) then post the link on this blog. Deal? Check back in 6-12 months.